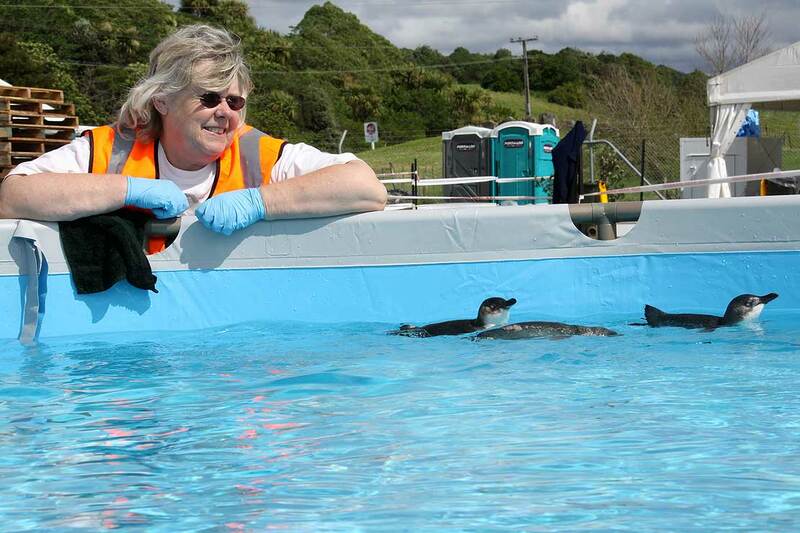 Experienced wildlife rehabilitator Chrissy Jefferson watching penguins practicing in pool. Wildlife rehabilitation requires a number of workers and volunteers to cover the large number of critical roles needed to care for sick or injured wildlife, including veterinarians, veterinary nurses and technicians, zoo keepers, wildlife rehabilitators, as well as people who don’t work in animal-related fields. Many of these people also assist and volunteer in high-pressure environmental disasters, such as oil spills. Lead author, Dr Polly Yeung of the School of Social Work, says the study sought to assess how these mixed-groups are coping in high-pressure environments. “The rescue and care of vulnerable wildlife is a rewarding, but profoundly challenging profession and in recent years there has been a greater reliance on volunteers to provide frontline services who may have varying levels of training to deal with the pressures of such as intense environment. “Even when workers have had a lot of training, the work can carry on for long periods, and there are multiple factors that put them at risk of compassion fatigue, a state of exhaustion that occurs from a prolonged exposure to the stresses of caring for sick and vulnerable animals, such as high numbers of patients, animal mortality, a shortage of funding for their work, and the technical challenges of the work itself, to name a few. “However, the work can also have positive benefits for the worker, known as compassion satisfaction, which is the enriching feelings that result from caring for animals both personally and professionally. The balance between compassion satisfaction and compassion fatigue is what we call their professional quality of life. The research project was a collaborative project between Massey University’s School of Social Work and the Wildbase Oil Response Team and sought to understand the stresses and rewards of caring for wildlife. Co-author Bridey White, a Technical Officer in the Wildbase Oil Response Team, started thinking about the topic while caring for wildlife during the Rena oil spill response. Together with Associate Professor Louise Chilvers, Dr Yeung and Ms White developed a survey to provide a preliminary understanding of the topic. Thirty wildlife carers voluntarily completed a survey, which included questions on socio-demographics, self-perceived quality of life, professional quality of life, job satisfaction, motivation for ongoing work in wildlife rehabilitation, and coping mechanisms. Overall, the sample showed high levels of compassion satisfaction and low levels of compassion fatigue. 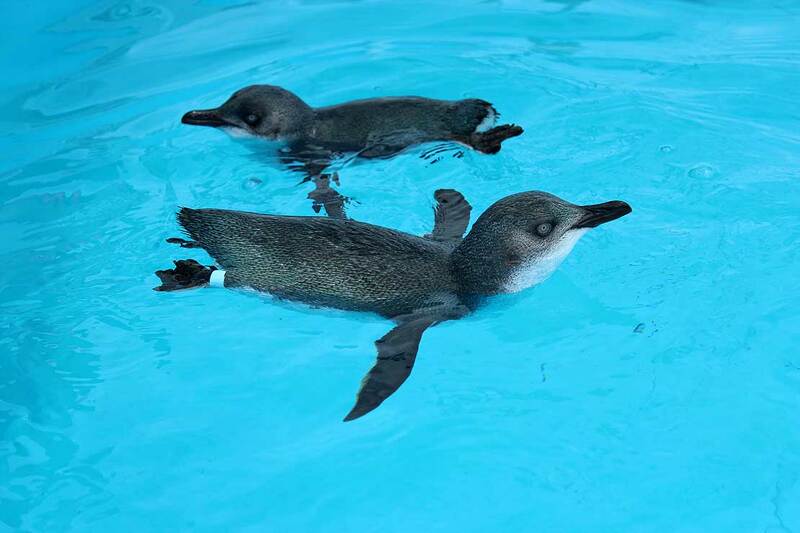 Pengiuns in a rehab pool. The study also found there were significant differences in compassion satisfaction and compassion fatigue on the basis of age, gender, financial capability, and years of experience. Dr Yeung sees this research “as an essential first step in developing a better understanding of wildlife carers, whether they are professionals or volunteers, and how compassion satisfaction and compassion fatigue are related in order to increase organisational support for developing and maintaining healthy work environments”. The researchers hope that the results may provide clues to help identify wildlife carers’ strengths for compassion satisfaction and vulnerabilities to compassion fatigue and to help develop strategies to improve their professional quality of life. The study suggests curriculum content for the training of these professions should include the personal application of coping strategies such as conflict resolution and stress management. “The results have implications for veterinary and animal-related practice training; students should be introduced to the concepts of self-care and multidisciplinary tools to help maintain physical, and emotional health,” says Associate Professor Chilvers. The study, Exploring Wellness of Wildlife Carers in New Zealand: A Descriptive Study, appeared in Anthrozoös November 2017.